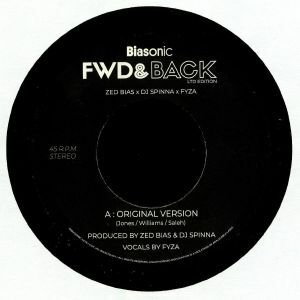 ZED BIAS/DJ SPINNA/FYZA FWD & Back vinyl at Juno Records. It was way back in 2008 when Dave Jones AKA Zed Bias joined forces in the studio with U.S hip-hop and house legend DJ Spinna and Manchester soul songstress Fyza. For one reason or another, the resultant track, "FWD & Back" was never released. Having recently rediscovered it on an old hard drive, Jones has decided to release it on Biasonic. The seven-inch contains both vocal and instrumental versions, with the former hitting home hardest thanks to Fyza's fine vocal, which reminded us a little of classic broken beat cuts by Bugz In The Attic and Neon Phusion. Musically, the backing track doffs a cap to those West London acts, too, as well as Jones' soul-fired bruk-up project for Hospital Records, Phuturistix.